While searching logpiles last month in a relatively intact tract “Selva Paranaense” near Paso de la Patria (Corrientes Prov., Argentina), the most interesting find for me was Desmiphora hirticollis, a bizarre longhorned beetle that is either amazingly cryptic or a curious mimic (I couldn’t decide). There wasn’t much else to be seen in the logpiles—it had been a very dry summer in northern Argentina, but I did find this interesting species of harvestman (class Arachnida, order Opiliones) huddled together in one of the punkier piles of wood. Knowing little about harvestman taxonomy (but knowing of several specialists who do), I sent the photos around for expert opinion. 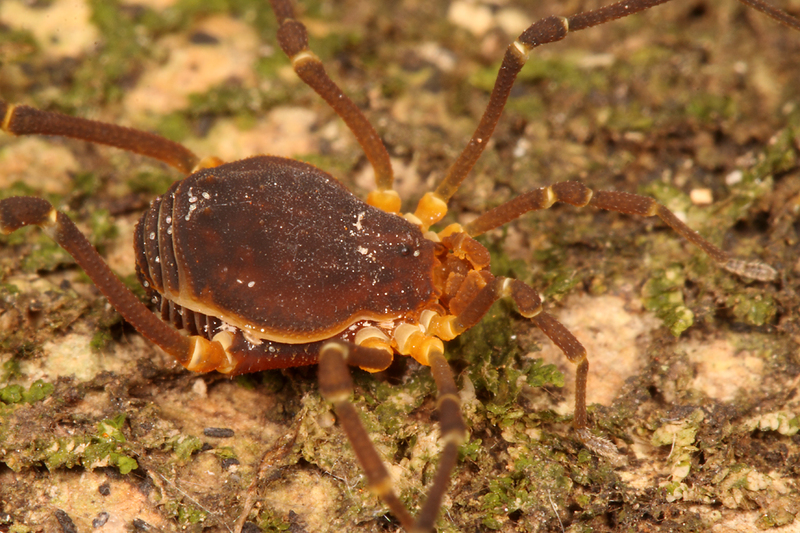 Everyone responded with the same opinion—family Cosmetidae, apparently distinguished by its spoon-shaped pedipalps. Marshal Hedin compared them to this similar-looking species photographed in Bolivia, Christopher Taylor (Catalogue of Organisms) thought they might be a species of Metalibitia and Ricardo Pinto-da-Rocha suggested M. paraguayensis as having been recorded from the province of Corrientes (although a specimen would need to be examined to confirm the identification). My thanks to each of these gentlemen for weighing in on a possible ID. 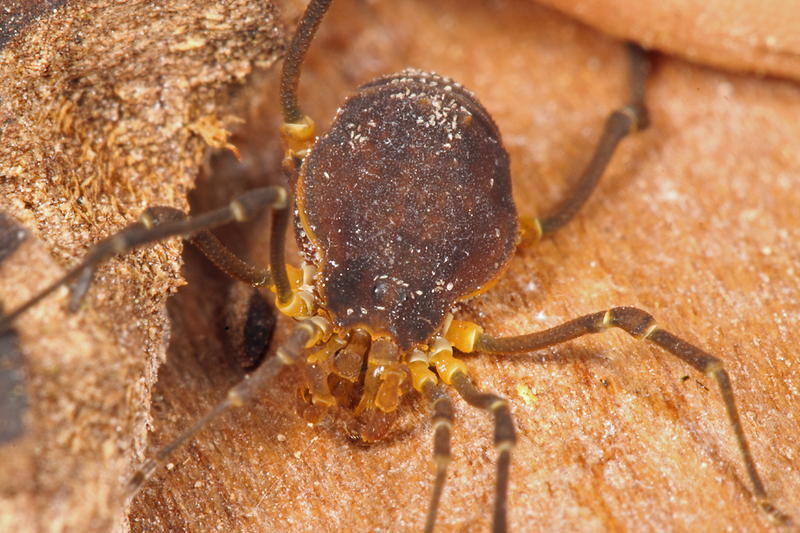 Argentina represents the southernmost extent of this strictly New World family of harvestmen, while to the north the family extends up to the southern U.S. (genus Vonones). In between, the family is diverse and comprises up to one-third to one-half of the harvestman fauna (Kury & Pinto-da-Rocha 2007). Many species in the family are ornately marked, giving rise to the family name which is derived from the Greek kosmetós (= ornate)—check out this gallery of photos at Flickr to see some truly spectacular examples. While I was photographing these individuals, and even when I first began processing the photos, I thought that they were quite dirty and debated whether to clean them in PhotoShop. Then I realized that the numerous white spots were not debris, but mites! Whether these represent a parasitic or phoretic relationship is not clear to me, however, and none of the gentlemen I sent the photos to offered any comment about them. 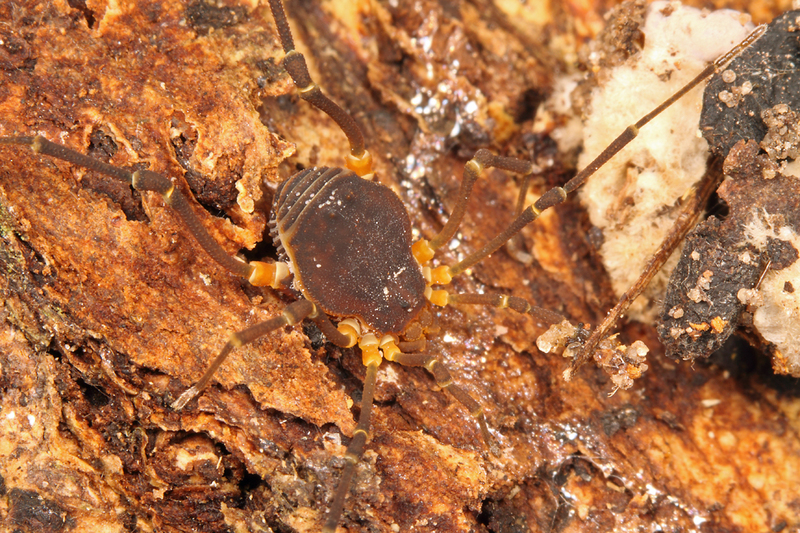 Erythraeid and thrombidiid mites are well documented as harvestman ectoparasites during their larval stage, with recorded hosts including Neotropical species of Cosmetidae (Townsend et al. 2008). The tiny, white mites on these individuals, however, do not resemble the large, red erythraeid mites (probably genus Leptus) that I have seen parasitizing our North American harvestman species, and their numbers on multiple individuals is, to me, more indicative of a phoretic relationship. 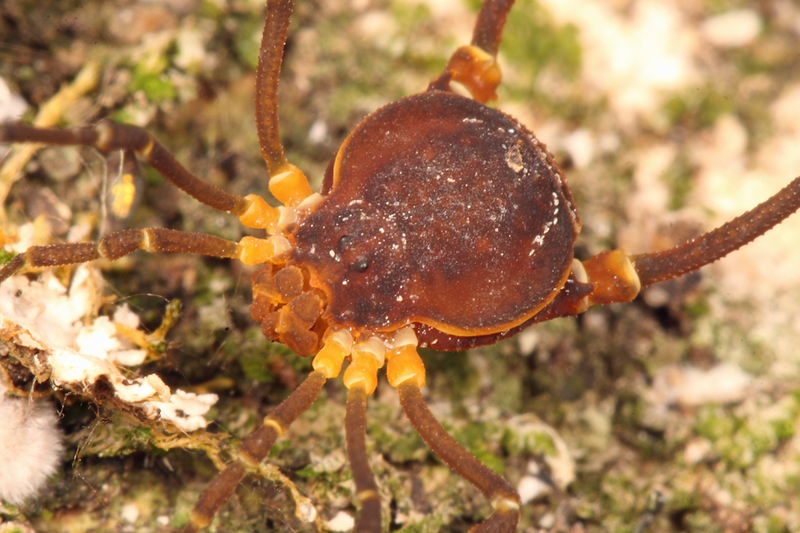 If you want to become thoroughly confused by the tremendous diversity of mites the parasitize harvestmen, see the comprehensive review by Cokendolpher (1993). 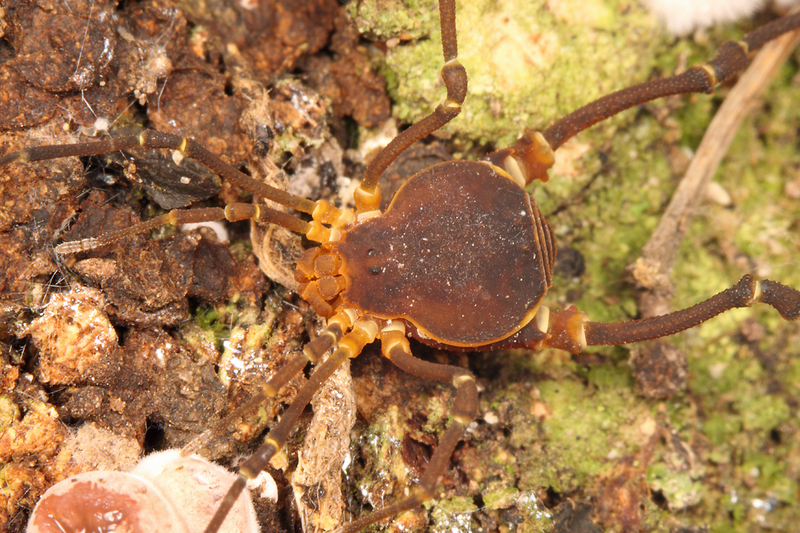 This entry was posted in Arachnida, Opiliones and tagged arachnids, Argentina, entomology, harvestmen, nature, parasitism, science. Bookmark the permalink. Hard to see enough details to be sure, but the white ‘colour’ makes me think Astigmata. The free-living astigmatids mostly feed on fungi and other microbes in patchy organic habitats, so a log pile is a good place to find them. They have a specialized dispersal stage, a heteromorphic deutonymph (often called a hypopus or hypopode), that is generally non-feeding (mouthparts are regressed to a nub) and has sucker plates for sticking on to arthopod cuticle. Again, I can’t be sure from the picture, but you may have other stages on the opilionid. Some Astigmata are ectocommensals on arthropods, but I’ve never heard of them living on opilionids. I’ll see what I can find out. I agree that they’re probably Astigmata. The very small size and unusual host suggests they may belong to the Histiostomatidae. Many species of Histiostoma live in various types of decaying materials and will hitch rides on many different arthropods. Dave & Barry – thanks for the additional information.